A federal judge ruled against Texas Gov. Greg Abbott’s decision two years ago to remove a mock Nativity display from the Texas Capitol that advocated the separation and church state. It all started in late 2015 when the Freedom From Religion Foundation placed a “winter solstice” display in the Capitol basement. The exhibit featured a cardboard cutout of the nation’s founding fathers and the Statue of Liberty looking down at the Bill of Rights in a manger. U.S. District Judge Sam Sparks for the Western District of Texas – Austin Division, ruled that Abbott violated FFRF’s free speech rights. 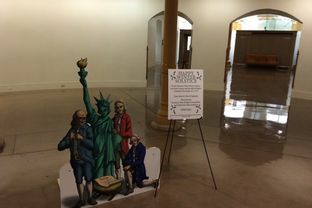 FFRF had placed a duly permitted display celebrating the Winter Solstice and Bill of Rights Day, in response to a Christian nativity at the Texas Capitol. The display, depicting founding fathers and the Statue of Liberty celebrating the birth of the Bill of Rights (adopted Dec. 15, 1791), had the requisite sponsorship from a Texas legislator. Abbott, as chair of the Texas State Preservation Board, ordered FFRF’s display taken down only three days after it was erected, lambasting it as indecent, mocking and contributing to public immorality. Sparks did not find that Abbott’s actions violated the Establishment Clause, but also ruled in FFRF’s favor that FFRF has the right to depose the governor for one hour. Abbott had fought the request for a deposition. I’ve read the decision and I’m a bit unclear as to what the deposition is about, but I believe it’s because there is an ongoing claim over Abbott violating FFRF’s free speech rights. I’m sure there will be appeals, so one way or another, this isn’t over. It is a reminder that if you’re going to allow religious-themed displays that you like on government property, you’re going to have to allow religious-themed displays that you don’t like. There’s a lesson in there somewhere, if you want to go digging for it. Trail Blazers has more. A lawsuit is moving forward against Gov. Greg Abbott over his order to remove a satirical nativity scene from the Texas Capitol last year. A federal judge ruled Tuesday that the Freedom From Religion Foundation, the Wisconsin-based group behind the exhibit, raised valid questions about free speech rights when it sued Abbott earlier this year. Abbott had asked the state Preservation Board to get rid of the exhibit, which advocated for the separation of church and state. The preservation board had initially approved the display, which featured a cardboard cutout of the nation’s founding fathers and the Statue of Liberty looking down at the Bill of Rights in a manger. Abbott, writing to the preservation board once the exhibit had gone up, denounced it as a “juvenile parody” intended to offend Christians. U.S. District Judge Sam Sparks wrote Tuesday that the lawsuit should proceed because Abbott’s order may have been based on the fact he simply disagreed with the viewpoint the exhibit was expressing. Groups are allowed to display exhibits in certain parts of the Capitol as long as they have a “public purpose,” according to state rules. 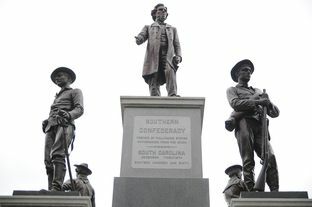 Abbott’s office said Wednesday it was pleased Sparks did not require the state to put the exhibit back on display. 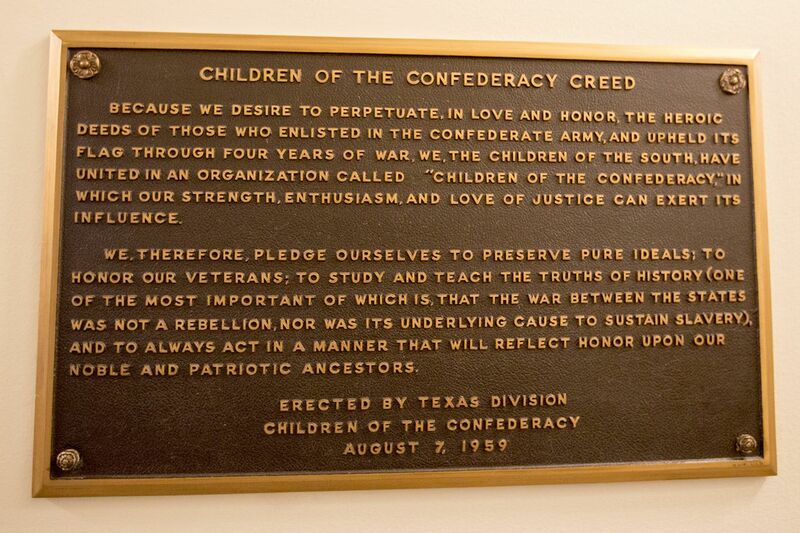 “Governor Abbott remains confident that the Constitution does not require Texas to display this intentionally disrespectful exhibit,” Abbott spokesman John Wittman said in a statement. See here and here for the background. I agree with the ruling, I support the FFRF’s lawsuit and I expect them to prevail, but I’ve come to the conclusion that Abbott doesn’t really care about the outcome of the case. He’s already gotten what he wanted out of this, which was to send a message to his supporters that he was there for them, giving the finger to those godless liberals who sneer at them all the time. Win or lose in court, he gets to polish his bona fides – hell, from that perspective, he’ll be even happier to lose, as that feeds the siege mentality. It’s of a piece with him ridiculous Twitter fight with non-Trump elector Chris Suprun. I suspect we’re going to see a lot more of this stuff over the next four years. The Dallas Observer has more. The Freedom From Religion Foundation filed a federal lawsuit today against Texas Gov. Greg Abbott over his removal of the group’s Bill of Rights display from the Capitol. Abbott downed FFRF’s solstice display, intended to counter a Christian nativity scene in the Statehouse, only three days after the permitted display had been erected on Dec. 18. The whimsical exhibit commemorated the “birth” of the Bill of Rights, depicting the Founding Fathers and the Statue of Liberty crowded adoringly around a manger scene containing the constitutional document. FFRF obtained a permit last summer for the December display, and a Texas legislator sponsored it. Also approved was an explanatory Winter Solstice sign promoting state/church separation, which pointed out that the Bill of Rights was adopted on Dec. 15, 1791. Abbott, who chairs the Texas State Preservation Board that approves Capitol displays, sent a letter Dec. 21 to co-defendant John Sneed, the board’s executive director, advising him to remove the FFRF display. Abbott lambasted the exhibit as indecent and mocking, implied it would promote public immorality, had no educational purpose and compared it to “Piss Christ,” a controversial 1987 photograph by Andres Serrano showing a plastic crucifix in a jar of urine. As governor, Abbott has assailed FFRF for asking the Brewster County’s Sheriff’s Office to remove crosses from patrol vehicles, and has complained when Orange, Texas, took down a nativity scene from city hall at the organization’s behest. See here for the background, and here for a copy of the lawsuit. I said at the time of Abbott’s tantrum that if it wasn’t the FFRF’s intention to file a lawsuit over this then they were wasting everyone’s time. I’m glad to see they were indeed serious about this. We already know that abbott applies religious principles arbitrarily, and I suspect he’s about to learn a lesson on that. I can’t wait. The Express News, the Current, and the Scoop Blog have more. Seems like the obvious answer to me. The display had been approved by the State Preservation Board, of which Abbott is chairman, after it was sponsored by state Rep. Donna Howard, D-Austin. Howard said she never saw it, but said it was described to her as a poster showing the nation’s founding fathers gathered around a manger with the U.S. Constitution inside. It was hung in the Capitol basement rotunda on Friday, she said. On Tuesday, Abbott wrote a letter to the executive director of the Preservation Board asking that it be removed. The board’s staff had approved it, but Abbott said the display is offensive, doesn’t serve a public purpose and doesn’t educate viewers. Howard said she was frustrated by the decision. The Capitol has a Nativity scene display outside and multiple Christmas trees. The Freedom From Religion Foundation has a right to express its beliefs, too, she said. “In light of all of the rhetoric around the First Amendment, it appears to me that this is going in the exact opposite direction,” she said. Earlier this week, Abbott released a statement expressing support for a Nativity scene outside the municipal building in the city of Orange. He said in that statement that Orange had a Constitutional right to display the religious image. He cited the Constitution again in his letter Tuesday. “The Constitution does not require Texas to allow displays in its Capitol that violate general standards of decency and intentionally disrespect the beliefs and values of many of our fellow Texans,” he wrote. Well, there’s one way to settle this, and that’s in the courts. I mean, if it wasn’t the Freedom From Religion Foundation’s plan all along to file a lawsuit once their display was predictably removed, then it really was no more than a juvenile parody. So come on, FFRF. Be like the Baphomet supporters and follow through. There’s a principle here that Greg Abbott is either willfully denying or just not able to see, and he needs to be made to understand it. The Statesman, the Current, and the Press have more.